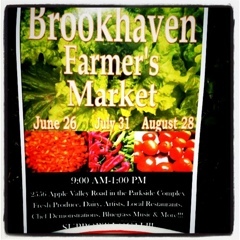 I went to the newly minted Brookhaven Farmers Market today. Today was the first of three Sunday markets planned for this year. The market was not the biggest With only 14 tents. However, even in such a small space they managed to provide a great market for the area. I picked up some excellent produce while I was there. Tomatoes, green cucumbers, zucchini, broccoli, and paddy pan squash. I also picked up a lemon cucumber. I had never seen A lemon cucumber before but I was immediately taken with how beautiful they were. As soon as I cut into the first cucumber I was hit by what is possibly the strongest smelling cucumber I’ve ever had. As aromatic as it was it wasn’t overbearing. 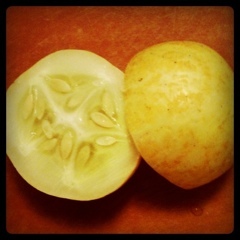 The skin was a little thicker than a regular cucumber but not so thick that you would want to peel it. As for the flavor, it was sweet and classically cucumber, I wouldn’t say it was anything special. However I do think that they were beautiful and will make wonderful pickles. My next exciting purchase was an amazing local Camembert. It came from CalyRoad Creamery. I can’t express how much I loved her cheeses. She also had a wonderful feta that I would add to a watermelon salad in a heart beat. Not to mention her assortment of goat cheeses. Apparently she also teaches workshops, which I will most certainly be checking out. Ancient Paths Farm. I also ran into Chef Chip from, one of my favorite places to go for a healthy and amazingly yummy lunch, Brookhaven Bistro. All in all I really enjoyed the farmers market. I hope to see what they become down the road. In the future I would like to see a better showing and some more variety. I also hope they can get some meats or even just eggs. The next to market days are July 31 and August 28.